On Trust Me, I'm a Doctor we decided to look at things from a different angle by asking: "Which fats and oils are best to cook with?" When you are frying or cooking at a high temperature (at or close to 180C or 356F), the molecular structures of the fats and oils you are using change. They undergo what's called oxidation - they react with oxygen in the air to form aldehydes and lipid peroxides. At room temperature something similar happens, though more slowly. When lipids go rancid they become oxidised. Consuming or inhaling aldehydes, even in small amounts, has been linked to increased risk of heart disease and cancer. So what did Prof Grootveld's team find? "We found," he says, "that the oils which were rich in polyunsaturates - the corn oil and sunflower oil - generated very high levels of aldehydes." I was surprised as I'd always thought of sunflower oil as being "healthy". "Sunflower and corn oil are fine," Prof Grootveld says, "as long as you don't subject them to heat, such as frying or cooking. It's a simple chemical fact that something which is thought to be healthy for us is converted into something that is very unhealthy at standard frying temperatures." Prof Grootveld generally recommends olive oil for frying or cooking. "Firstly because lower levels of these toxic compounds are generated, and secondly the compounds that are formed are actually less threatening to the human body." "If I had a choice," he says, "between lard and polyunsaturates, I'd use lard every time." Our study also threw up another surprise because Prof Grootveld's team identified in some of the samples sent in by our volunteers a couple of new aldehydes that they had not previously seen in the oil-heating experiments. "We've done some new science here," he says with a smile on his face. "It's a world first, I'm very, very pleased about it." I'm not sure that our volunteers would have been quite so thrilled to discover their cooking had managed to generate new, potentially toxic compounds. So what is Prof Grootveld's overall advice? He thinks the ideal "compromise" oil for cooking purposes is olive oil, "because it is about 76% monounsaturates, 14% saturates and only 10% polyunsaturates - monounsaturates and saturates are much more resistant to oxidation than polyunsaturates". When it comes to cooking it doesn't seem to matter whether the olive oil is "extra virgin" or not. "The antioxidant levels present in the extra virgin products are insufficient to protect us against heat-induced oxidation." Polyunsaturated fats Contain two or more carbon-carbon double bonds. When eaten in as food such nuts, seeds, fish and leafy greens, they have clear health benefits. 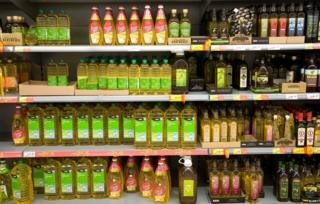 However, the benefits of consuming sunflower oil and corn oil, although rich in polyunsaturates, are much less clear. Monounsaturated oils Contain just one carbon-carbon double bond. They are found in avocados, olives, olive oil, almonds and hazelnuts, and also in lard and goose fat. Olive oil, which is approximately 76% monounsaturated, is a key component in the Mediterranean diet, which has been shown to significantly reduce the risk of heart disease. Saturated fats have no double bonds between carbon atoms. Although we are encouraged to switch from eating saturated fats, particularly dairy and other fats derived from animals, the benefits of doing so are being challenged. Which fats can make you healthy? After years of being told, and telling others, that saturated fat clogs your arteries and makes you fat, there is now mounting evidence that eating some saturated fats may actually help you lose weight and be good for the heart, writes Michael Mosley.